Two strong rounded cords that attach the skull to C2 (Axis). 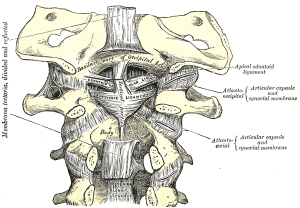 Arise from either side of the odontoid process and attach to the medial aspect of the occipital condyles. Taut in flexion, limit rotation and side flexion to the opposite side. Play a role in stabilizing C1 and C2, especially in rotation. Injured in rear end motor vehicle collisions when the cervical spine is in extremes of rotation. ↑ Magee DJ (2007). Orthopedic Physical Assessment (5th ed). St Louis, MO: Saunders Elsevier.